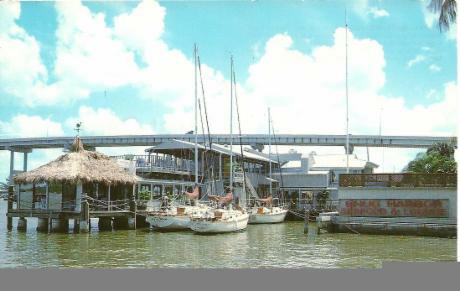 Snug Harbor Matanzas Pass 645 Old San Carlos Blvd. In 1921 the hand-operated, drawbrige tender's home became the weather station and crashboat barracks site, during WWII in the 1940's. At this site, by 1950 the "Snug Harbor" small wooden structure, with existing docks, became a quick stop for ice, cold beer and a sandwich. Soon it was a place to view the "catch of the day" from charter boats, as seen above with the "Madam Queen". (Deep sea fishing - all day - $5.00 per person). 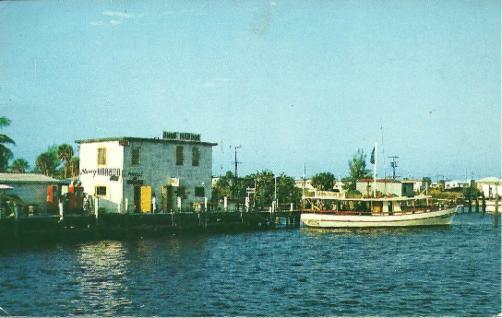 Later it became a place to return for a meal, as local shrimp was added to the "fresh catch" menu at the Snug Harbor Marina. As early as 1957, the Beach Coast Guard Auxiliary was formed on this island using the remaining barracks, for the purpose of "search and rescue". 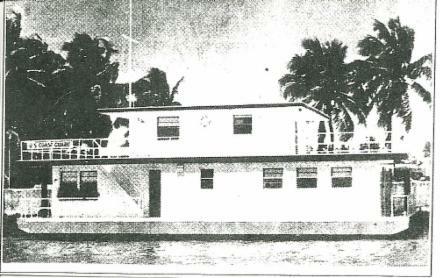 By 1960 this Coast Guard houseboat was moved directly across the bay and dedicated as the U.S. Coast Guard Station in 1963. Today's ships patroling in the Gulf waters from Key West to Pensacola, remain in this safe harbor, and we proudly salute these men and women in uniform. Meanwhile, Snug Harbor had withstood numerous tropical storms and was nearly demolished by Hurricane Donna in 1960. It was rebuilt and expanded over the water, with more dockage as a favorite local seafood and steak restaurant with an extensive menu. In 1994 a vast remodeling of this popular restaurant was underway with an upstairs lounge, as seen above, with live entertainment and full bar. The panoramic view of Estero Bay's spectacular sunsets provided a breathtaking setting.